e.g. During chase target facing South direction, giving the transform facing North-East, CameraBot will assume the chase target facing North-East instead of South. this feature allow developer to override the direction of current chase target. it also affect the clamp angle, because the clamp angle and depend on the chase target forward as a reference to locate their current related angle with chase target. Real Local – the camera upward will depend on rotate angle, low performance cost and also fixed the “Gimbal lock” issue. the problem to using this setting, are combine with chase target & camera offset, when camera are far away from the orbit camera idea position, when user rotate the camera they may notify the camera result in “tilt angle”, or they will feel dizzy (Off-vertical axis rotation) when they rotate or move very fast. Local – the setting will mix “Real Local” & “World up” solution, to perform a relative stable upward direction for the camera. but it take higher perform cost. Custom – you can design your own upward reference to implement your solution. in “Editor mode” preset will record the position and angle related to the chase target as the origin orbit position. and Up & Down represent the angle by transparent color in blue. as the image shown below. (Left = 45 degree, Right = 180 degree, both related to the origin angle. The major feature for clamp angle section, to toggle rebound feature. 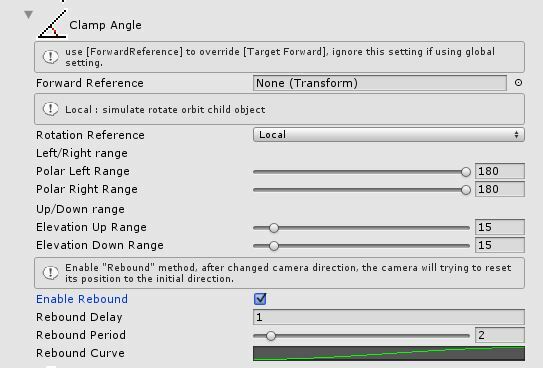 by enable this feature, developer will allow to control the camera behavior: when and how to return it origin angle of orbit camera.